F - F/E - F/Eb F-Bb ..:: kontakt freebies ::.. Here's some instruments I've created for Native Instrument's Kontakt sampler. They are free to download and use in your music, be it personal or commercial. Please do not re-distribute them without prior permission. Sizes are of the compressed archives. If you find these instruments useful, please consider making a donation. According to Wikipedia, "A friend of Dipper and Mabel Pines, Soos is a portly and lovable man-child whose desire to be where the action is makes him an excellent resource for the twins when they need a ride about town. He seems to have a wide variety of talents, specifically DJing." Helping people be as skillful as him might not be possible for me, but providing a virtual recreation of some of his gear is. Also, this clone is waterproof. Some samples from the Gauntlet arcade game captured with MAME 084b with the -wavwrite switch. It has a few of the classic narrator lines, so far for the warrior character only. I might add more in the future. Some samples from the Pac-Man, Ms. Pac-Man and Jr. Pac-Man arcade games captured with MAME 084b with the -wavwrite switch. It has the intro and death sequences, the playing sounds looped and a few one-hits.
.:::::: Manos: The Hands Of Fate, MST3K ed. ::::::. Samples from the legendary movie Manos: The Hands Of Fate according to Joel and the bots. The pull-down menu lets you choose between 6 groups of samples. Four of them have samples of the characters saying something very Manos, and each has two or three characters. There's one group that has a few of the songs, looped, plus some of the sound effects (including background hiss), and the 'Best Of' group has a few of each, so you can make your own Manos in real time, with music and all. Minutes of fun making your own Manos dialogs! Did I say Manos? The delay can be used for extra creepiness. Sadly, these sounds are from a lossy source, not that i think it would matter much in the end. 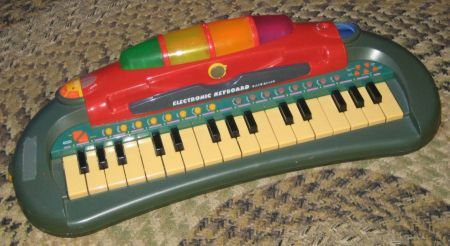 Keys are colored to separate characters or types of sounds. Thanks go to the KVRians EvilDragon, loachm and streifentier for the help with the scripting.
.:::::: Maestro Concert Grand ::::::. 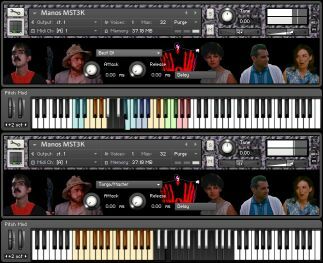 This is a conversion to Kontakt of the Giga piano Mats Helgesson released in 2003. The samples are from a "Yamaha CF-3 grand piano from the early 90s. It was recorded with a pair of Neumann KM84 microphones in X/y stereo. x/y provides excellent mono compatibility. The samples are sorted in 5 velocity layers, of which velocity 0-30 are piano, 30-59 are mezzo piano, 60-89 are mezzo forte, 90-108 are forte and 109-127 fortissimo." The original set had patches for the note sounds (Sustain), key release sounds (Releases) and a few additional noises (Effects). This Kontakt instruments combine all three into one. The 'effects' are mapped to C-1 to F-1. The notes and release noises are A-1 to C7 and a volume knob controls the gain for the releases. At 0dB is the original volume, while the default ot -3.5dB is what I think sounds natural. The 'release' control can be set to max for the sustain pedal down effect, and the default of 288ms I think sounds close to a pedal up sound. I'd be happy to tweak if you guys don't think it sounds natural. Lastly, there were two patches for the piano labeled A and B with different velocity curves and both are represented here as well (Maestro Concert Grand A.nki + Maestro Concert Grand B.nki). Soni Musicae is hosting the original Giga set and can be downloaded here: http://sonimusicae.free.fr/matshelgesson-maestro-en.html. The University Of Iowa has been recording various instruments and making the samples available on their site for a few years now (http://theremin.music.uiowa.edu/). This instrument is a cello with samples at 3x 1/2 steps intervals and was recorded in stereo. The MONO set available by using the menu in the main face is simply the left channel of the STEREO set. It's far from perfect, but you can consider this a quick preview for other, and hopefully better instruments that I will be releasing in the near future. Nevertheless, I think it's usable. This is a simple instrument with samples from the Akai MPC60 drum machine made by request from a fellow musician and KVR'er. It has two kits selectable from a menu on the face and has a few basic effects. The one shot samples are mapped from C1 to D#2, according to general MIDI. C3 to B3 will play some rhythms with the sounds from kit1 @ 120 bmp. These beats are looped audio. The samples for this instrument came from my '84 Ibanez Roadstar II, which sadly is not with me anymore. Even though the plan was to sample each note with round-robin, all pickup positions, this incomplete project only has ~5th intervals of the bridge and neck positions, palm mutes seem to be 1/2 steps only for the bridge pickup, and there's 2-tone up-slides for the bridge pickup at higher velocities. The keyswitch at C1-C#1 switches between normal and muted (only bridge). All samples were recorded DI, and the Power button on the main face turns all face effects off at once. There's one more 'position' that plays the bridge samples looped. As it is now it can sound a bit rough, but playing chords with a softer amp envelope can sound interesting. There's a few more pages with whatever I could think of adding like arpeggiator, filter and that weird kotekan script. This artifact was a dumpster rescue and was sampled for posterity. The Kontakt instrument contains every sound this thing was capable of producing, from mandolin and bell sounds, to dog barks, beats and full demo songs. The Instrument menu lets you choose the sounds and page two lets you find your way around. Photo is of actual item.
.:::::: Fairlight CMI IIX Factory Library ::::::. These are Kontakt instruments for all the floppy disk factory sounds of the Fairlight CMI IIX. They were recorded from the output of a Fairlight unit by Rob Brady, two notes per sound, and looped by yours trully. The face has some basic controls for amplitude envelope, transpose up to two octaves, filter and mono/portamento. Hosting is kindly provided by LBN @ http://synthpop.com/. These instruments were made with the Mellotron samples captured and shared by Taijiguy and used with his permission. For the original samples and more info, visit his site here: http://www.leisureland.us/audio/MellotronSamples/MellotronSamples.htm. Besides the obvious, there's also LAS mode which loops the samples and stretches the range a bit to three octaves, marked by pink keys.